Nobody got offended at this though. Make your minds up! Women rightly are allowed to dress as they like, but only through the dumb prisom of identity politics. Well if you are a white male. Then you cannot even go out and celebrate Haloween, as you will be too life like to actual horror. As did you not know that white men are pure evil? According to the loony PC leftist brigade? This guy is Bulgerian, by the way, not British. I think too that people are getting a bit cheesed off with being called racist for every slight. The insult is wearing a bit thin. If you fart in the key of A flat minor, you might insult Count Basie's trumpet solo of 1956. What would the analogy be? If someone tattooed a number on his wrist, strung a gas mask around his neck, wore a fake long, crooked nose, and had loads of fake money stuffed in/falling out his pockets...and he introduced himself as 'Cohen' or 'Stein'. Would that be offensive? Original Quill wrote: What would the analogy be? If someone tattooed a number on his wrist, strung a gas mask around his neck, wore a fake long, crooked nose, and had loads of fake money stuffed in/falling out his pockets...and he introduced himself as 'Cohen' or 'Stein'. Would that be offensive? How is that comparrison to a film actor/actress? How is looking like Samuel L Jackson in fancy dress, a racist sterotype? Insulting Jews by symbolism. Insulting blacks by symbolism. You need to ask? What are the racist sterotype tropes here? Nope, originated in Ancient Greece? Samual L. Jackson is a brilliant actor, who happened to play a black gangster/murderer. It’s about portraying the role he played, Jules Winnfield. If someone dressed as James Baskett and went to the party as Uncle Remus, wouldn’t you be offended? Blackface is symbolic of a character played by Lincoln Theodore Monroe Andrew Perry, better known by the stage name Stepin Fetchit. The name of the character says it all. I once "blacked up" and played a vegetarian cannibal chief in a stage comedy. So anyone dressing up as Elvis Presley. When they are not part white/part Cherokee Indian, is being racist towards white people and Cherokee Indian then? 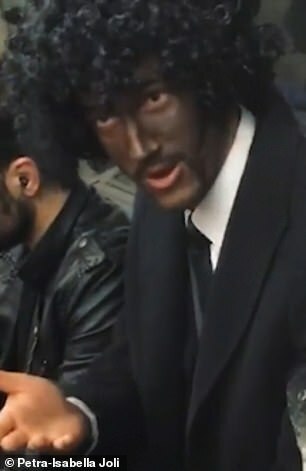 This is not blackface, but a person trying to look as much as possible like the Character played by Samuel L jackson in Pulp fiction. Unless of course where white people tan in the sun and where fake tan. Or black people whiten their skin is now racist to you? Does Quill think he is a racist now as well? Didge wrote: So anyone dressing up as Elvis Presley. What role? I've already explained it's the symbolism. Roles are art, and certain works of gain a familiarity in the public eye. We call that symbolism. A brown shirt with a black arm band is Nazism. A white man in a black mask riding a white horse is the Lone Ranger, white hero, representing law and order in the old west. A blackface associates a black man with ""slow-witted and lazy". It's neither the actor, nor the dress, but the associations and entailments brought forth in the original public apprehension of the role. The script...a black man fallen into crime, presumably by inner-city upbringing. So again you have no reason to class this as racist, just something from the past which had racism behind that, where people blackened their face to mock black people. That is not the case here, as easily seen, by trying to look like a character from a movie. As where is the racism in that? So you think Johnny Depp is also racist? The actors are not at fault. Nor are the script writers. It's the people who want to idolize the evil entailed in the symbolism. I think rather than being racist, it's flattering to want to look like a character from a movie....proves Samuel L Jackson made a lasting impression playing the part. He (man on tube) would have looked pretty silly dressing up as the character if he hadn't blacked his face after all. Original Quill wrote: The actors are not at fault. Nor are the script writers. It's the people who want to idolize the evil entailed in the story. So you are saying Samuel L jackson is now evil? Syl wrote: I think rather than being racist, it's flattering to want to look like a character from a movie....proves Samuel L Jackson made a lasting impression playing the part. He would have looked pretty silly dressing up as the character if he hadn't blacked his face after all. I dont see any evil....sometimes I think the evil is in the onlooker. 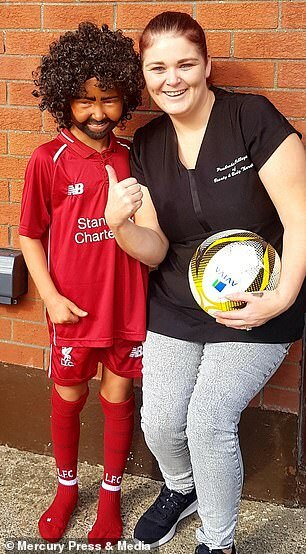 Haha....he would have looked a dead ringer for Harry Enfields scouser if he hadn't blacked his face. Syl wrote: Haha....he would have looked a dead ringer for Harry Enfields scouser if he hadn't blacked his face. Exactly and I bet Quill would have never objected. Even though within the show, that is him taking the piss out of scousers how they look, dress, sound and act. The story wasn't about Samual L. Jackson. He just played a part. The evil is entailed in the plot of the script, which gives up a symbol. Going back to Lincoln Perry, his story yielded a blackface, which was/is symbolic of a "slow-witted and lazy" black man, representing an opinion about blacks. We are dealing, now, with the many rabbit-holes that you jump down. That last sentence is the core of the matter. The blackface reminds one of the evil, and wishing to perpetuate the insult of the evil, the onlooker adopts the symbol and intentionally goes on the perpetuate the association. So when anyone dresses up as the drug taking simple minded killer John Travolta played in the film, or the character Uma Thurman played, she who temporarily died of a coke overdose....what would that be then Quill? The two characters in that film are also popular in spite of them both being white. Frankly, I have yet to render an opinion about the underlying example. I've been too busy explaining the simple dynamics of political symbolism to you and others. I mean there is no blacks who kill in America or gangs is there Quill? As it made his case, so easily redundement, he tried to move on past this badly ignoring it. Didge wrote: You have explain to Syl, that you believe that its racist to apply a person in a film as black as a killer, doing evil as wrong and racist, but the same does not apply to the white charcters in the film. Your phrasing is as convoluted as your thinking (rabbit-holes and such). I'll just begin over again. Roles are art, and certain works of art gain a familiarity in the public eye. We call that symbolism. A brown shirt with a black arm band is Nazism. A white man in a black mask riding a white horse is the Lone Ranger, a white hero, representing law and order in the old west. A blackface associates a black man with "slow-witted and lazy". It's neither the actor, nor the dress, but the associations and entailments brought forth in the original public apprehension of the role. That is symbolism. The actors are not at fault. Nor are the script writers. They are just artists who typify the genre. It's the people who want to live out, and thus eternalize the evil entailed in the story, who are the true racists. How is Samuel L Jackson playing something comparable to Lincoln perry? Didge wrote: How is Samuel L Jackson playing something comparable to Lincoln perry? You're asking me to be a film critic? I don't think Jules Winnfield, in Pulp Fiction, is comparable to Stepen Fetchit, exactly. Pulp Fiction was written by Quinton Tarantino and Canadian producer/director Roger Avary, to be a modern depiction. The blackface of Perry's character was probably not foremost in their minds. I think the character is an amalgam of symbols. Stepen Fetchit is the obsequious, "slow-witted and lazy" depiction of a black. Jules Winnfield, in Pulp Fiction, is the black and what he has grown into under the contaminated circumstances in which Stepen Fetchit began. In other words, the moral of the story is: if you deny a man his dignity and self worth, he will eventually demand it by brutal means. Of course, that's only my opinion. You're asking me to be a film critic? I don't think Jules Winnfield, in Pulp Fiction, is comparable to Stepen Fetchit, exactly. Pulp Fiction was written by Quinton Tarantino and Canadian producer/director Roger Avary, to be a modern depiction. The blackface of Perry's character was ptonsnly not foremost in their minds. You just claimed previously, that it was the same portrayal, from the character of Stephen Fetchit and now do a back step and claim you are not a film critics. Hence why even bring up Blackface if you believe they are not comparable? Didge wrote: You just claimed previously, that it was the same portrayal, from the character of Stephen Fetchit and now do a back step and claim you are not a film critics. Original Quill wrote: I don't think Jules Winnfield, in Pulp Fiction, is comparable to Stepen Fetchit, exactly. Original Quill wrote: In other words, the moral of the story is: if you deny a man his dignity and self worth, he will eventually demand it by brutal means. They also make arguments on self worth and dignity, but does that then make their views right? Hence we go back the core aspect here, that there is no bases for the character of Samuel L Jackson turning to crime, based on a loss of dignity or self worth, based around race. Dont you look very simple now? Johnny Depp is part Native American. Brevity is the purpose of symbolism. For example, words are symbols. If I look at an ocean and say How beautiful is the Pacific Ocean, do I need to know the back story of the salinity or chemistry of the water? No, I'm being brief and only referring to it's beauty. A film script doesn't purport to give you the back story of the character's life. It would destroy by confusion the whole point. A story is told only by selecting pieces of life, and making a point. The character serves the script. HT wrote: Johnny Depp is part Native American. So am I...my grandfather was very proud of the fact. Or, in other words, you have no answer. You could always go to your room and sulk.